This urban fantasy novel releases on November 7th, 2017. 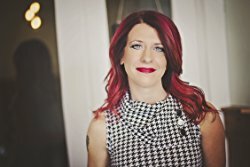 We’re excited to share with you an exclusive interview with the author, Stacey Rourke, and a giveaway for A FREE Kindle Fire, a signed copy of Veiled, a NPI Bill pin, and an “I voted, #backthefang” sticker. 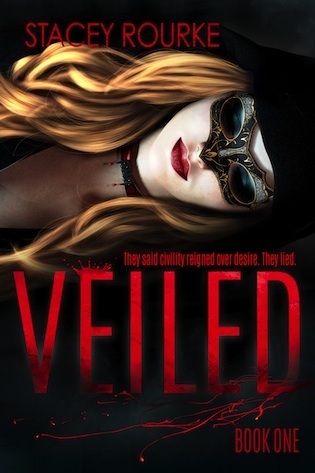 Who is your favorite character in Veiled? Vinx, she is a badass chick without a doubt. How long did it take you to write the book? Did you encounter any setbacks? Three months for the first draft, and three months to get through the editing process. No real setbacks, thankfully! I plot, outline, do character development … then start on the first draft that goes in a completely different direction of all the careful planning I’ve done. Have you had other jobs besides author? If so, how how those influenced your writing? I’ve wore a lot of hats: manicurist, sales associate, office manager, and marketing director, just to name a few. All of them have helped to guide me and shape me to market not only my books buy my brand as an author. When I first release a book I read a few of the reviews to get a sense of how the book is being received, after that I stop. Reading every new review would easily becoming an obsessing for me, and that would just stop up the creative process. Probably Celeste Garrett from The Gryphon Series. She is a pure soul with a warrior spirit, not to mention her snarky humor is loads of fun. The world could use more people like her. If you woke up tomorrow with the knowledge and skills to do every kind of job, would you still be an author? Absolutely, I would just have a lot more details to add to all of my character development! LOL! A huge thanks to Stacey Rourke for taking the time to answer my questions! Tagged 2017 release, giveaway, interview, Stacey Rourke, urban fantasy.